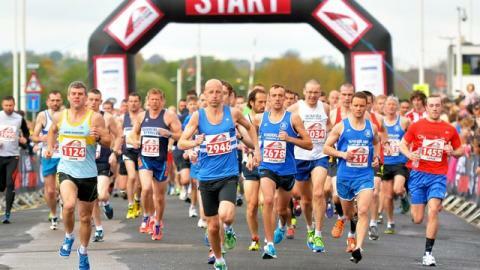 The Sunderland City 10K and Half Marathon events take place on Sunday 7 May. Whether you're going to cheer someone on or you're taking part yourself, plan your journey with us. Services 2 & 2A - will run normal route via Chester Road from Washington, but will then be unable to serve Ryhope Road, Stockton Road Gyratory or Toward Road and will divert via Queen Alexandra Road, Tunstall Road, Belvedere Road and Stockton Road until 1pm. Buses will observe Stand H in Park Lane during the race times. Service 9 - will be unable to serve Newcastle Road or St. Mary's Boulevard and will divert from Newcastle Road via Thompson Road, Southwick Road and Queens Road to Queen Alexandra Road and Trimdon Street until 4pm. Service 20 - will run normal route via Durham Road to and from Durham, but to and from South Shields will be unable to serve the City Centre or Newcastle Road and will divert via Thompson Road, Southwick Road and Queens Road to Queen Alexandra Road and Trimdon Street until 4pm. Service 35A - will run normal route from Chester Road towards Sunderland, but will then be unable to serve the City Centre, North Bridge Street or Keir Hardie Way and will divert from Southwick Road to Queens Road, Queen Alexandra Road and Trimdon Street until 4pm. Service 38C - will be unable to serve Burdon Road or Holmeside and will divert via Belvedere Road and Stockton Road to Park Lane until 1pm. Service 39 - will run normal route from Chester Road, but will be unable to serve Ryhope Road, Stockton Road Gyratory or Toward Road and will divert via Queen Alexandra Road, Tunstall Road, Belvedere Road and Stockton Road to Park Lane until 1pm. Service 56 - will divert from Southwick Road to Queens Road, Queen Alexandra Road and Trimdon Street to reach St. Michael's Way and will be unable to serve Keir Hardie Way, North Bridge Street or City Centre until 4pm. Services 60 & 61 - will divert from Ryhope Road via Queen Alexandra Road, Tunstall Road, Belvedere Road and Stockton Road to Park lane and will be unable to serve Ryhope Road or the Stockton Road Gyratory system until 1pm. Service 135 - will run normal route from Chester Road into Park Lane and then be diverted from Park Lane to St. Michaels Way and Trimdon Street towards Queen Alexandra Bridge and will be unable to serve the City Centre until 4pm. Service 136 - will divert from Trimdon Street to St. Michael's Way, Albion Place and St. Mary's Way/Stockton Road to Park Lane, then normal route towards Chester Road, but unable to serve City Centre until 4pm. All other services that run via Chester Road or Durham Road are unaffected.